He died walking across America for climate change. Hear his last words. On Saturday afternoon, Mark James Baumer, 33, of Providence, Rhode Island, was was killed when he was struck by an SUV while walking along U.S. Hwy 90 in Florida. 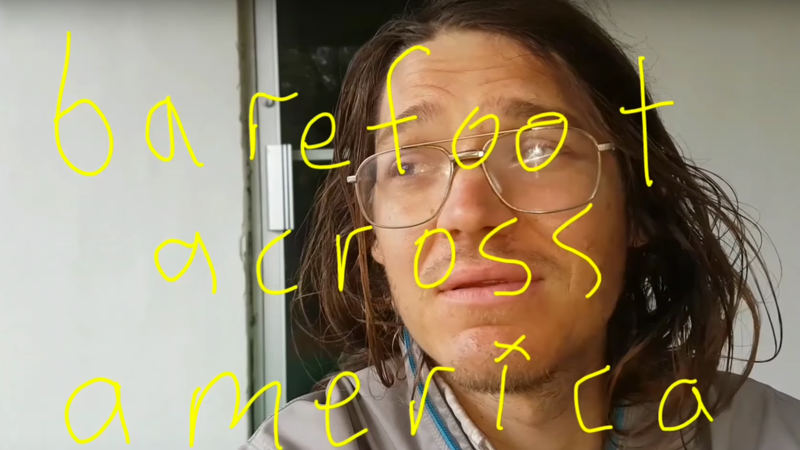 It was his 100th day of walking, and it put a tragic end to his barefoot walk across America to raise awareness and money for climate change. Baumer was planning to donate all the money raised during his walk—the second time he was planning to walk across the country (the first time in 2010 he wore shoes)—to the FANG Collective, a group building, supporting, and escalating nonviolent resistance to the natural gas industry. In a video posted just hours before the horrific incident, Baumer laments the state of his country, with a particular vehemence for the newly sworn in president, Donald Trump. It's raining in the video, and Baumer considers taking a day off before ultimately hitting the road for the last time. At one point in the video he states: "We now officially have a president who does not believe in climate change. He wants to the world to burn so he can profit…If you support this man, you do not support human life on this planet. Plain and simple, you do not support the future of Earth as a planet." The green carpet where I slept was dry even though it rained most of the night. I could feel an insanity resting deep in my face. The moon was still visible but it could not save us. I spent most of the morning looking at my phone and wondering if any of the thoughts inside of it would survive. Something terrible would soon be able to touch the all the nuclear codes. When I began walking I had an urge to stop traffic until all the roads in america died. One day everyone will be able to walk down the middle of the road free from all the violence this society has built. I passed a golf course and felt unhinged. I hope you’re happy touching sports so good you never notice when everything finishes burning around you. Before I left Defuniak Springs I stopped at a grocery store and bought some kale. The day felt monumental not because it was my hundredth day of walking across america but because a man who hates everything except himself (or any other rich white man) will be free to burn the world for profit. We now have a president who does not care about the future of humanity on planet earth. I’m ashamed of the majority of white men of america to the point I want to remove all evidence of being a white male from my body. It began to rain so I sat on a bench and watched the rain. My dad called. We talked about trying to find hope in a system where the only safety net will be wealth. Part of me wanted to curl up and wait for my brain to melt but instead I began walking in the rain. With each foot step I felt more angry and helpless. Grow an organism so large it drowns out anyone and everything who has ever tried to harm a living being. Anyone who supports the president does not care about humanity or the future of earth. If you support this president you openly admit it’s okay to hurt women, people of color, minorities, the disabled, poor people, or anyone in need. I wish there was a way to transfer all the emotional and physical violence of this new presidency from those at risk to myself. I am out here in america. Please bring me your hatred and pain. We would have been better off electing a barrel of burning tires as president. As I was passing a junkyard a man with a pickup full of old washing machines yelled, “trump for president.” I asked him why he wanted to see the world burn. He just laughed. The language of this world has maybe died and been replaced with another hole that can only say things its own thoughts already believe. I need people to understand this earth does not only have to create systems of death and wealth. When it got dark my legs didn’t want to do anything else. I walked another four miles in the dark. My map said I was near a church but the only thing I found was a cross next to a carport. I crawled under it and went to sleep before I even finished zipping my sleeping arrangement closed.